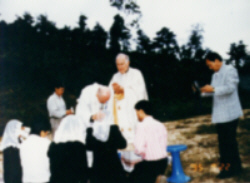 It looked like a heart when we first examined the photos taken September 22, 1995 during the Mass celebrated in a valley among the Naju hills in Korea. Some time in November, 1995, I showed the photos taken to a pediatrician, Dr. Helen Owen. After attentive examination, she said the heart in the photo was the size and had the exact configurations of the heart of an infant. Sebastian, the layman present during the celebration with his camera, calculated the thickness of the host turned heart in the mouth of Julia against a twig he had in hand. The heart was about 5 mm. thick. The pediatrician further noted the various particulars, the lines of the veins in the heart and other features. It was a perfect human heart, not like a valentine, but a real human heart, the size of the heart of a child. It was Friday, September 22, 1995, when two priests, Fr. Joseph Finn and Fr. Aloysius Chang and I had concelebrated the Eucharist in an out-door celebration amidst the Korean mountains at 5 p.m. There were sixteen Korean Catholic faithful present with Julia Kim, the Korean visionary, and ourselves, participating in this Mass. We had prepared the large white host, and the number of small white hosts together with the wine for the Eucharist. The three of us had concelebrated Mass a week before, Friday, September 15 an hour later, at 6 p.m. And we had to finish the celebration by car light; it was pitch dark. After that first Mass Julia came up to me with a question. She had seen a rainbow in the night sky at the time of the consecration, and asked me what could be its significance. The thought that occurred to me and that I shared with Julia through our translator, was that first biblical rainbow after the great flood. God used it as a memorial to the first covenant he established between Himself and renewed mankind. We had just celebrated the memorial of the final covenant in the Divine Liturgy or Eucharist when Julia saw her rainbow. For me it was the culmination of the day. I had been looking forward to this celebration with expectation, not in view of witnessing a miracle, but just to offer my daily Mass. The only communications we had with Julia during the week were through her Korean translator, Raphael; our life in Naju was lived from moment to moment .We never knew what each day would bring. We could plan nothing. Friday, September 22, 1995 turned out to be a day of celebration. Fr. Finn and I were treated to a festive fish dinner at a sea-side restaurant near the Pacific. Julia and the group of the little community in Naju went all out to celebrate our visit, together with Korean sashimi and squirming fresh squid. After lunch we boarded our vans and continued to travel, with me wondering when we would celebrate Mass. It was after 4 p.m. when we drove into the compound of the valley. It was only when we finally entered the valley that I knew we were to celebrate Holy Mass. None of us even dreamed of this other celebration that the Lord and His Mother were preparing, a heavenly love feast at the Eucharistic banquet of the Lord at one of the most awesome miracles granted by Our Lord in the twenty centuries of the history of the Church; to witness the awesome transformation of the consecrated host and wine into the very Body, nay the very Heart, and the Precious Blood of Jesus Christ, through the intercession of His Mother. The rest of us received the Eucharistic Body and Blood of Christ, but in Julia's mouth the Eucharistic species of the Host, the wafer, and the species of the wine in the chalice, changed to the species of flesh and blood. The rest of us savoured the taste of wafer and wine as we received Holy Communion. We knew with divine faith that these were the very Body and Blood of Christ in the Eucharist. We were joined to the living and glorified Christ, renewing His mystical and real oblation, offering Himself as the Divine Victim and His Mystical Body to the Father. As Julia experienced the commingling of blood and flesh, the flesh expanding and moving in her mouth and the strong odour of blood, Fr. Finn observed the white of the host disappearing and changing into the dark red of living flesh. In Julia's mouth the species of unleavened bread changed to the species of flesh and the species of wine changed into the species of blood. In the twilight of 5.30 p.m. that momentous Friday the rest of us observed the moving flesh on her tongue and the blood brimming under her tongue and filling the creases of her lips. It was only later, as we examined the photos, that we began to apprehend the full magnitude of the miracle. The host had changed into a living and vibrant heart. For the first time, human eyes saw the living Heart of Our Lord and Saviour, the Heart that had so loved the world that It offered Itself in holocaust that we might live and not be lost. All those present at this memorable evening shared the same sentiments. We were one in mind and heart. It was two months later, in November, that I finally received and read the text of the message of Jesus to Julia during her communion, in the French translation of Fr. Spies. As I read this message from our Lord during the time of communion, I became aware that the words of Jesus confirmed our conjecture. "My Mother is now showing and revealing My heart to a bishop...". What we had viewed that September evening was the very heart of Jesus. The reactions of others to this phenomenon, with whom I shared the pictures and my account of our experience - well, that was another thing. They covered a vast gamut from incredulity and disbelief, cynicism and indifference to silence, wonderment and awe before this mystery of faith; a profession of faith in the Eucharist, in the Catholic Church, in the sacrament of the priesthood, of conversion and Christian faith. Remarks included, "How gross!" and questions, "How was a photographer so conveniently present?" Accusation, " Julia slipped a heart she had hidden on her person into her mouth!" Denial, "This is private revelation; I don't have to believe it!" And from still others, there was a total lack of responsiveness. Such were some of the negative comments and reactions. However, I was invited to share our experiences the following weeks in the home of a Seoul business man before a group of 15 Koreans, largely Catholics. Our hostess, a Buddhist, who had some exposure to Christian and Catholic teachings, believed immediately and forthwith decided to take Catholic instruction and to be baptized in the Catholic Church. Her Korean Methodist friend believed immediately and resolved all the questions she still entertained about the Catholic Eucharist and the celibate Catholic clergy. On the other hand, others: priests, theologians, bishops and Catholic laity to whom I showed the photos, bogged down by their theologies, remained indifferent or were even horrified before this new evidence of their Catholic or Christian faith. underlined and stressed that His flesh is real food, and His blood is real drink for eternal life, and that whoever eats His flesh and drinks His blood, has life everlasting in Him, and He will raise us up on the last day. The theology and the doctrine of the Catholic and the Orthodox Churches have been constant to the present day. Bread and wine become the body and blood of Christ. This promise of Christ became a stumbling block for the Jews and scandal to the gentiles. It has remained so to liberal Catholics, theologians, laity and even priests and a scandal to the Protestants, even to the present day. Yet Jesus' words are clear and He never retracted them. As the Pharisees and Sadducees, and even His disciples left Jesus - only His twelve apostles remained - the Lord, heavy-hearted, turned to His apostles with the question, "Will you also leave me?" And from those banks of the sea of Tiberias, He scanned the ages even to this our present age, and watched as those who had come to know Him through His Church, turned away in disbelief and incredulity. His lament and His accusation of the neo-modernist intellectuals in the Church continues. "Will you also leave me?" Observers of the pictures and of the story of the miracle have raised two specious theological counter-arguments. The first invokes the authority of the Council of Trent. The Eucharist contains the glorified and immutable body of Christ. How can the Eucharist bleed or change into living bleeding flesh, still less, change into a living heart? Secondly, what purpose can such a miracle serve? The history of the Church records more than one hundred and sixty approved Eucharistic miracles. I invoke two. The miracles of Lanciano and Bolsena in Italy. At the beginning of the eighth century a Basilian monk of Lanciano (near Chieti in Italy) was tormented by doubts after pronouncing the words of consecration during Mass. Before his eyes the Sacred Host visibly changed into flesh, except in the centre where the sacramental species remained intact. The consecrated wine changed into a bright red blood, that coagulated into five small clots. This miraculous host and blood have been preserved to the present day. The popes of that period confirmed the authenticity of the miracle. And in our own days the Holy See commissioned a group of scientists for laboratory research in 1970. The Osservatore Romano of April 3, 1971 reported their findings, which confirmed that the blood is real blood and the flesh is real flesh composed of cardiac muscle tissue. The flesh is heart tissue. Both the host and the blood belong to the same person. This miracle continues now for 1200 years. (For a more complete report cf. the May 1972 issue of IMMACULATA, Kenosha, Wisc.). Popes Leo X, Clement X, Leo XIII, and others have confirmed the authenticity and the veneration or cult given to this Miraculous Eucharist. The second miracle is the story of an unknown monk, Peter of Prague. It was the time of the Eucharistic controversies of the thirteenth century. The priest monk Peter was celebrating Mass at the main altar in the church of Saint Christina in Bolsena some time in 1263. The story goes that he was assailed by doubts in the truth of the Eucharist. He continued to celebrate. He pronounced the words of consecration over the host and elevated the host, the unleavened bread turned into flesh and began to bleed profusely. News reached Rome quickly and the pontiff, Pope Urban IV , who was in Orvieto at the time, set out for Bolsena. At the request of the pope the local bishop went to bring him the miraculous host. The Pope was so eager to observe and to venerate the miracle that he hastened to meet the returning processions. They met at the Bridge of the Sun at the entrance to Orvieto. The Pope fell to his knees in adoration of the Eucharistic Lord, whose bleeding Eucharistic Body lay on the corporal. The corporal has been preserved in the Orvieto cathedral to this present day. The following year, August 1264, the Pope instituted the feast of Corpus Christi in honour of the Blessed Sacrament and he commissioned St. Thomas Aquinas to write the office of the feast. St. Thomas' are the hymns O Salutaris Hostia and Tantum Ergo. The Church has acknowledged the authenticity of these Eucharistic Miracles and many others. It has acknowledged similar miracles, the bleeding of the Eucharist, in Venezuela and elsewhere in this decade. There were nine significant Eucharistic miracles at Naju itself that preceded the miracle I am now presenting. The miracles began with the appearances of images of the Eucharist or the chalice in pictures taken of the weeping statue of Our Lady in Naju. Later, the Host received in communion by Julia changed in bleeding flesh, as testified by the priests and faithful present at communion. The papal pro-nuncio to Korea, Mons. Giovanni Bulaitis, was present when an invisible hand (of St. Michael the Archangel, as Julia later explained) placed the large host in her mouth. Although the diocesan commission of Kwangju has not yet spoken on the twelve Eucharistic miracles that have taken place to date in association with Julia Kim, two bishops, Archbishop Giovanni Bulaitis, the papal pro-nuncio to Korea and I, have authenticated our own experiences. Archbishop Bulaitis, Apostolic pro-nuncio to Korea has been following the events of Naju and has presented his findings to Pope John Paul II. And to the astonishment and dismay of skeptics, the Holy Father himself was privy to the same miracle of the Eucharistic host becoming a living heart during the celebration of the Eucharist in his papal chapel in the Vatican, when Julia Kim received communion from his hands. Although the Pope has not spoken of this himself , a recent publication in English of the messages and miracles of Naju includes the report on the miracle and the texts of the messages of the Blessed Virgin. Another difficulty I encountered with the theologians was, "what purpose could such a phenomenon serve?" We have to ask the Author of this phenomenon and miraculous event in the first place, not Julia or me. Who are we to dictate to the Author of these Miracles, the Eucharistic Lord Himself, what He is to do with the mystery of the Eucharistic miracles? In His infinite compassion for us and for the countless numbers who had and continue to have problems with the Catholic doctrine of the Eucharist, Jesus Himself gives us His heavenly confirmation. The Eucharist is truly the Body and Blood of Christ, present under the species of bread and wine. 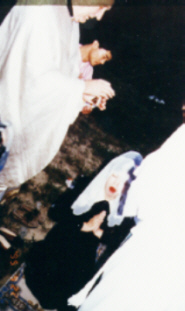 In Naju, He gave us the miracles of the weeping and bleeding statue of His Blessed Mother beginning on June 30, 1985. And now He gives us these Eucharistic miracles to confirm the Catholic faith in the Eucharist and the authenticity of the heavenly messages communicated to us through Julia Kim. Heaven is serious in its warnings and calls us to repentance and to return to the fount of Divine Mercy before it is too late. These miracles, and especially the Eucharistic Miracles, are the last appeal of Divine Mercy. Jesus wants to forgive and to save us, even at this eleventh hour of the loss of faith and growing apostasy, from the horrendous punishments that hang over the world and this sinful generation, especially of those who still claim the name of Catholic and Christian. In His message of September 22, 1995, Jesus laments over His priests; "If my priests who celebrate Mass daily, would truly believe in and seek to experience this Presence with their whole heart and would live the sublime and marvellous Divine Reality ...innumerable souls would be purified and would live in My merciful heart with a grace that is beyond all expectation." He laments about our theological head trips and the lack of a living love response. "There are many priests...who claim to know that I breathe and live in the Eucharist, that I am present body and blood, soul and divinity, but they do not really know me well." He is speaking of those who were shown " my living presence several times (the earlier Eucharistic miracles in Naju) through my little soul (Julia)". Yet notwithstanding this, He continues, " those of my children who follow me are few." He laments about our theological sophistries: "Many ecclesiastics want to make me known through sophisticated argument and complex reasons, forgetting the Eucharist which is my substance, and the sublime simplicity of the Gospels that I proclaim. This is like throwing mud at simple people". And Jesus concludes:"Make haste to begin to live a life of devotion through prayer, sacrifices, penance so that you may attain the final victory and to make acts of reparation for the most abominable sins of blasphemy that have been committed." "Have mercy on me and I will have mercy on you." A young American woman who was on the same Marian cruise through the Caribbean in March, 1996 as I, approached me the last day of the cruise. She told me the Lord had given me this message to her in locutions. Why would the Lord reprimand me with such hard words? I had given witness to Him earlier that week with my account of the miracle of Naju; and now what is He telling me? As I reflected again on the message, the words of Jesus resounded in my ears: "Apostasy and infidelity are bringing this world to the brink of ruin; too many of my representatives continue to sleep. In truth, my representatives even allow themselves to be seduced by false prophets. The present disorders continuously torment me; they rend my heart, they become the lashes that endlessly tear at the Sacred and Immaculate heart of My Mother." "Have mercy on me and I shall have mercy on You." These words received a strange confirmation on Friday June 30, 1996. I had called Lubbock, Texas and was speaking with Patricia Devlin's daughter, Eileen. When she recognized me, she continued. "Bishop, do you remember the message you received during the cruise: "Have mercy on Me and I shall have mercy on you"? How could I forget these words? Eileen continued. " Jesus, the Divine Infant of Prague had uttered these same words to a priest who had found the mutilated body of the statue after the sack of the Carmelite convent in Prague. And as he pulled the statue out of the heap he heard the words, "Have mercy on Me, and I shall have mercy on you." In her message to Julia during the papal Mass, the Blessed Mother recapitulates: "The visible change of the Eucharist today was to show that Jesus came to you through the Sacrifice of the Holy Eucharist, which is a repetition of the Sacrifice completed on Golgotha to wash away the sins of the world with His precious Blood...Let all know the Sacred Real Presence of the Lord in the Holy Sacrifice of the Mass.. ". (Message of October 31, 1995). The unusual events around Julia, her messages and the phenomena are private revelations, that must be discerned by the Church. The weeping and bleeding in tears of the statue of the Virgin, though of the order of private revelation, are first and foremost observable phenomena, that can be perceived by our senses and by scientific examination as well. The Eucharistic phenomena are also observable facts, witnessed and testified by many, including bishops and priests. The Eucharist which changed into the flesh of the human heart and blood is an observable phenomenon, but it is also a reality to be accepted by divine faith. We believe with divine faith that every host and every drop of wine that has been validly consecrated become the Body and Blood of Our Lord. The consecrated species are signs of the substantial presence of the living Christ. A second miracle took place in Naju; the transubstantiated species of bread and wine were further transformed into the species of blood and flesh or heart, that are also the signs of the Eucharistic substantial presence of Christ. All these are supernatural events that could be actualized only by the power of God, present in the mystery of the Eucharist. There is one last lesson to be learned from this Eucharistic miracle of Naju. Jesus has chosen to transform the host, a sign of the Divine Bread of life, into the sign of His love, His heart. If He appeared to Saint Gertrude in the middle ages, to St. Margaret Mary Alacoque in the 1600's, to reveal to them the mystery of His love, Jesus has chosen, in these our times, to reveal to us the living reality of that Heart that so loved us; and not only of His own heart, but the infinite and eternal dynamic and living love of the Blessed Trinity that gives Itself to us in the Incarnation of Jesus, the living love of Jesus Himself, the Incarnate Word of God who is all love, all heart, in His Eucharist, in His Eucharistic Heart. Too often even those who believe in the Eucharist, continue to think of it as merely a sacrament of the Body and Blood of Jesus. We find it difficult to connect this sacramental presence with the real and mystical presence of the Whole Jesus, of the Incarnate Word of God, who is Love and Who has chosen this means to become present to us, not only in sign but in His awesome divine reality. He wants to abide in us and us in Him as He abides in the Father and the Father in Him in His love, through His Eucharistic Heart. Jesus is the very Heart of the Trinity. A contemporary mystic, and too often maligned, Maria Valtorta, describes this mystery of Love. She places in the lips of John the beloved disciple, this ecstatic vision of the mystery of Christ, the Incarnate Son of God. "You are in the bosom of the Fire that is the eternal Love of the Most Holy Trinity, its Nature, its Essence, its Real Essence.... You are the Second Person of the ineffable mystery, which is God and which I penetrated because God has drawn me to Himself...You, God the Son, You are like the Father, You, God like the Holy Spirit, You, centre of the Trinity...because if You were not the love of the Father and the love for the Father, then the Love, the Divine Love would be missing, and the Divinity would no longer be Triune and it would lack the most becoming attribute of God, His love..." (Maria Valtorta, The Poem of the Man-God, vol. 2, p. 95). And it is this love that gives itself to those that wish to receive it in the mystery of the Eucharistic Heart of Jesus, the Divine Victim of Love.